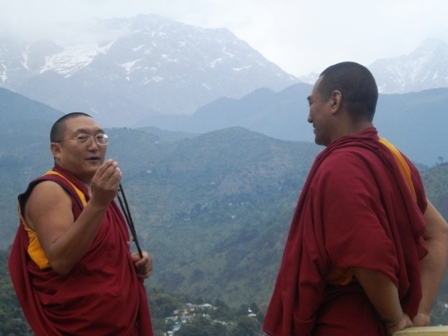 Practise Dalai Lama Tour on Environment in Dharamsala with a Carbon-Free Green Himalaya Trek, Experience the Natural beauty of the Tea Gardens, Alpine Flowers, Healthy Food and Herbal Tea !
" In the remoteness of the Himalayas, In the days of yore, The land of Tibet Observed a ban on hunting , on fishing. 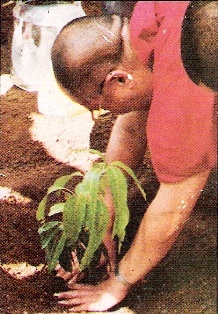 On a certain day, month and year, One should observe the ceremony of tree planting. Thus one fulfills one's universal responsibilities, Serves one's fellow beings, and benefits all ! " H H The XIVth Dalai Lama. I have been asked many times to organise a Dalai Lama Tour and I have always questioned myself as to what I should give on this tour?! Inspired by the teachings of His Holiness and his concern for the environment, I decided to give an experience which has today become a part of my lifestyle. One day in a year, take some time off with your family and friends, discover your green fingers in the garden...go for a day trek in the Himalayas and enjoy natural healthy food, lush green tea gardens, hidden shrines...discover the ancient snake temple of the Rain God Indru-Nag ! One single day when we will abstain from eating non-veg food... today we will earn some karmic credit ... for today no carbon emissions on taxi drives, just walk..walk.. and walk !! 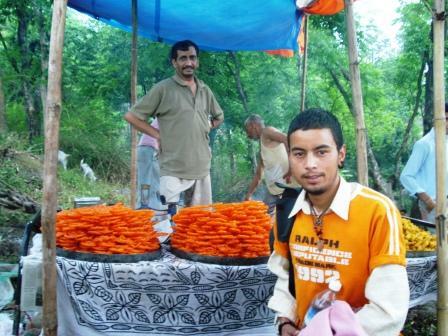 An exciting day in Dharamsala Trekking. Next time we will do this on our Triund trek. Start your day at Dawn...! Our guest from Virginia-USA , Mindy Frost visiting us the second time for a month long vacation in May 2007 with her 13 year old son, Nathaniel was very interested in the Dalai Lama Tour..a Green Day ! 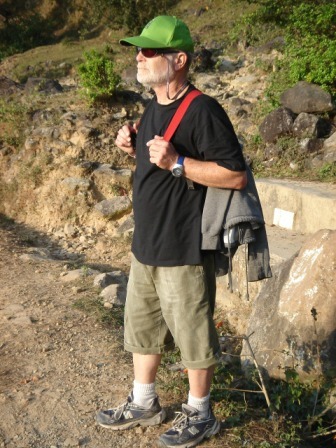 While we were familiar with the trek upto the Indru-Nag Snake Temple we had heard from our old mason about the hidden Tea Gardens right on top of the Hill and just above our Mountain retreat..'Vidya Niwas.' 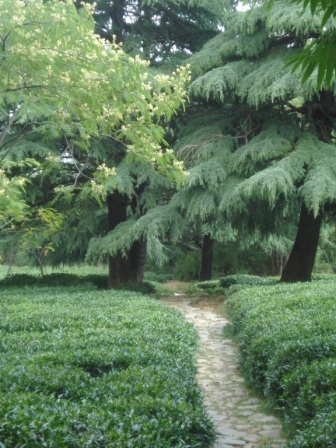 We decided we would go up the Temple and return via the Tea garden on our soft adventure. 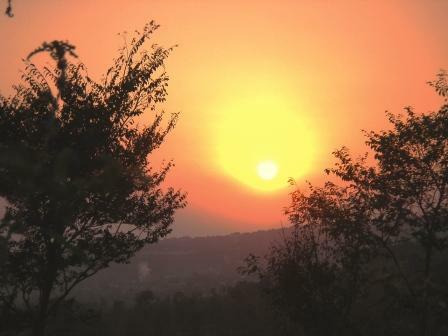 As it was going to be a long day, we got up early dawn and started for the trek with a light breakfast. 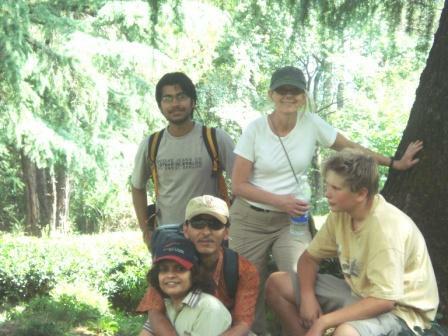 Apart from our Digi-cameras, we took our organic coffee and lunch packs.We were a party of six, with our 13 year old daughter Naintara and our trek guide...Many tourists follow this trail of Indru-Nag Temple and it is very popular ! The beautiful nature walk up the Temple on top of the hill (1200 metres) was a like a natural energizing health guide to us on our Dharamshala Treks. On the way we met some Tibetan monks starting their day with morning prayers and debate. There was an air of spirituality in the fresh morning environment of the Himalaya mountains and our Dalai Lama Tour for the day seemed to be truely blessed in Dharamsala ! Our first glimpse of the Snake Temple on the Dalai Lama Tour was awe-inspiring. The temple was vibrant with colours and activities. There was a village 'puja' going on with locals, foreigners and the Brahmin priest. There were Indian delicacies in the Mela (Fair). 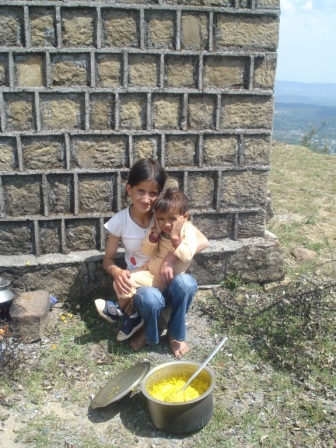 A community meal dham was also being prepared, along with ladies singing 'Bhajans' (Local hyms). 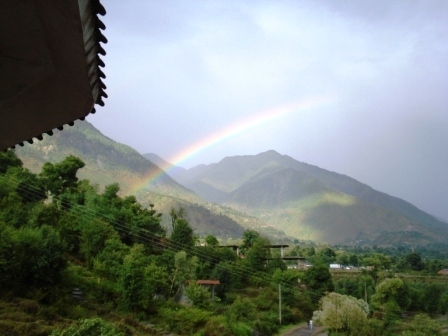 All in all it was a very special way to have a vacation in India in Dharamsala ! Celebrating a village Dham on a Dalai Lama Tour made a lot of sense to me. 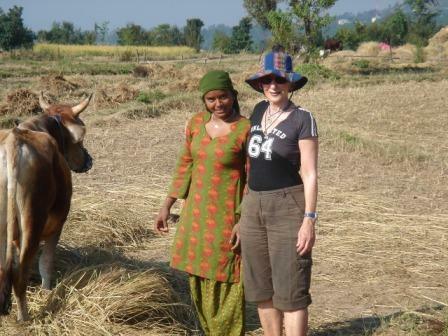 In the Himalayan villages, the main economy consists of crop agriculture, cattle for milk, food and wool. 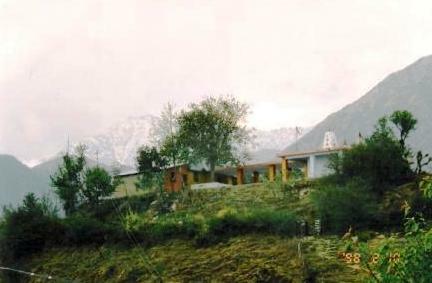 The small Himalayan homes are made of stone and with black slate roofs. A village Dham is a community feast...and the food is mainly rice with a lot of cereals made by a special Brahmin community called 'Botis.' 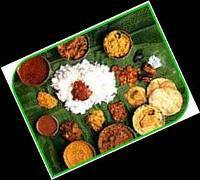 The food is served in plates made out of dried leaves which are completely disposable as animals eat them after usage. After enjoying our lunch, we spent some time in a nearby village watching the people doing terrace farming and spending some time with the local natives. 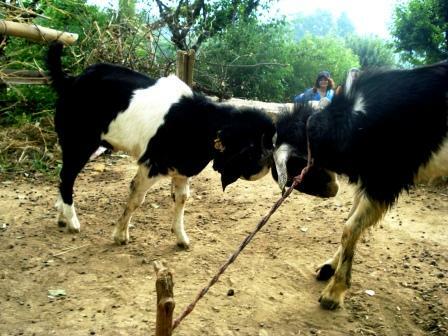 We also saw some interesting goat fights and enjoyed some local herbal chai. 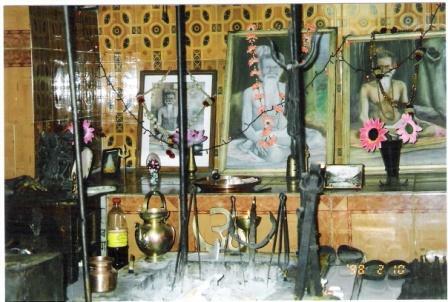 The temple Priest explained the real meaning of the om symbol in the Hindu and the Tibetan community. This Dalai Lama tour was proving to be very different but just as interesting..! In the first part of our Dalai Lama Tour it was all about the Mountains and the natives, the next part was all about Meditation, solitude and tranquility. 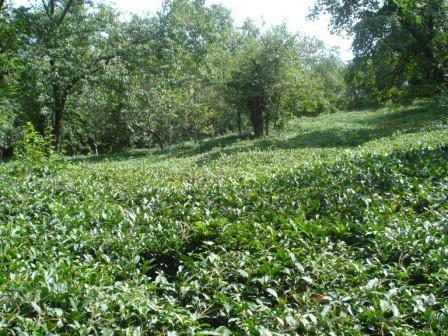 While coming back, we discovered the hidden Himalayan Tea Gardens and it was an eye-feasting sight. The ancient fir trees, the birds chirping, old pine trees, and not a single human soul in sight, gave a feeling of being one with nature. These sights cannot be talked about or described.. the moment is one which can only be experienced !! This Dalai Lama Tour proved to be a healing of the soul but we were tired... it was also raining by the time we got back. The smell of wet earth under our feet, the fresh Himalayan air and the gloriously green ecology all around us .. was spectacular !! We had a simple dinner of yummy Pizza's baked in the home oven with local fruit wines and juices. To end the day we wished for a rainbow and there it was in all its seven colours... my daughter told me it was a view worth a million dreams.. !!! Ultimately, the decision to save the environment must come from the human heart...Dalai Lama, for more on Dalai Lama's thoughts on the environment, click here! Discover the Dalai Lama Tour in Dharamsala and more on trekking routes in Himachal Pradesh, Enjoy custom made package holidays and practice the actual teachings of Tibetan Buddhism in real life....! Be Gentle with the Earth, Share Ecological Responsibilty ! 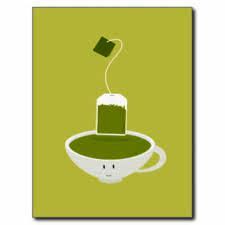 While in Dharamsala...grab some Kangra Green Tea !